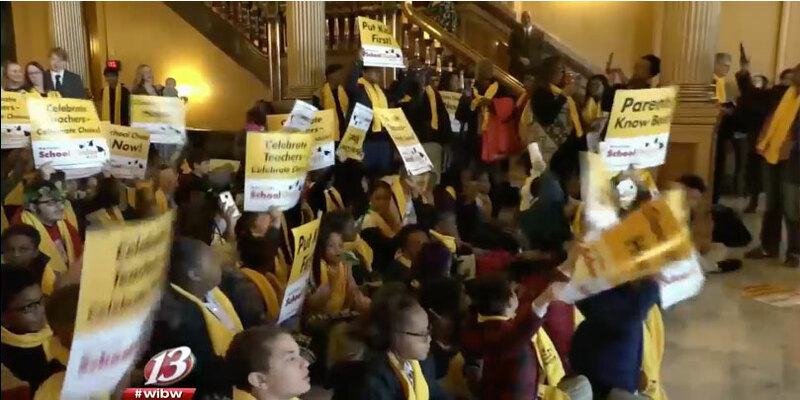 TOPEKA, Kan. (WIBW) – Community leaders rallied at the Statehouse on Thursday to mark National School Choice Week. Students, parents, teachers, and other supporters crowded in to celebrate the week’s flagship event. “We are beyond the hour when every family can choose for themselves what school they want their child to attend.” Superintendent of Urban Preparatory Academy Wade Moore, Jr., said. “The reason I like my school is because when I go there it feels like I can be myself, and I don’t have to change what I do, or how I act,” Smith said. “We need to free the children because if they are forced into a school that’s not working for them where do they go to get their lives back.” Speaker David Landwehr asked. Superintendent Moore said the goal is not only allowing a students’ parents to choose their school of choice, but they want the money provided by taxpayers for each public school student to follow the student if they choose to attend another school.